It’s safe to say that one of the most important concerns you have as a nursing executive is that you and your nursing team are able to deliver safe and cost-effective patient care. However, you are also responsible for managing several significant metrics that can affect your healthcare organization’s rankings. Through TigerText’s patient care coordination software, you and your team can realize time savings, productivity gains, and improvements to quality of care. You can reach physicians when you need them most, coordinate with other departments in real time, and get patient information when you need it. The Scheduling and Roles features make it easy to know who’s on call without having to find a whiteboard schedule or call someone to ask. 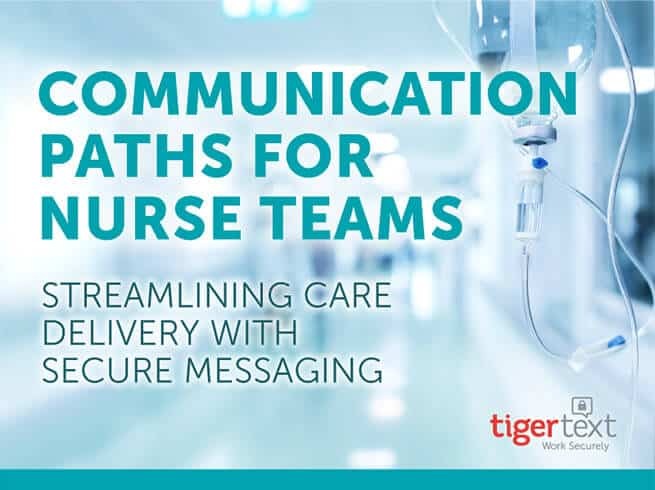 TigerText can also optimize a broad range of hospital processes using clearly mapped communication paths for hundreds of workflows. This means you and your nurses can spend more time caring for patients and less time tracking down physicians or engaging in redundant tasks or tracking down physicians due to poor communication between doctors and nurses. Improve patient outcomes by expediting communication of status changes. Expedited obtainment of new order and results for STAT labs. Expedite the process of discharging patients by quickly resolving logistical and care plan issues that typically cause delays. Improve the speed and accuracy of special meal requests by communicating order details via text. Improve the speed and logistics needed to change a patient’s IV 72 hours after insertion. Nurses, get fast answers with no phone tag. Stay connected to the entire care team.